Since finally winning the world middleweight title in 1980 and firmly establishing himself as one of the best boxers on the planet, Marvelous Marvin Hagler had been like the prettiest belle at the ball who, for whatever reason, just cannot attract a good dance partner. 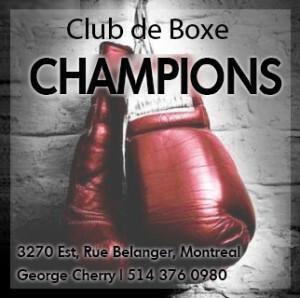 While other champions shined in high-profile, media-saturated events and made huge money, the only boxers Hagler could tango with had names like Fulgencio Obelmejias and Mustafa Hamsho, unknowns who aroused zero excitement. Still, Hagler was doing okay; widely acknowledged as, pound-for-pound, the finest pugilist in the world, his title defenses were main event programming on the different television networks. But in terms of waltzing to the bank with seven figure checks, Marvin had to wait and wait. While Sugar Ray Leonard, Roberto Duran and Thomas Hearns were generously rewarded for grooving in the spotlight, Marvin shuffled in dark corners with dance partners few wanted to watch. 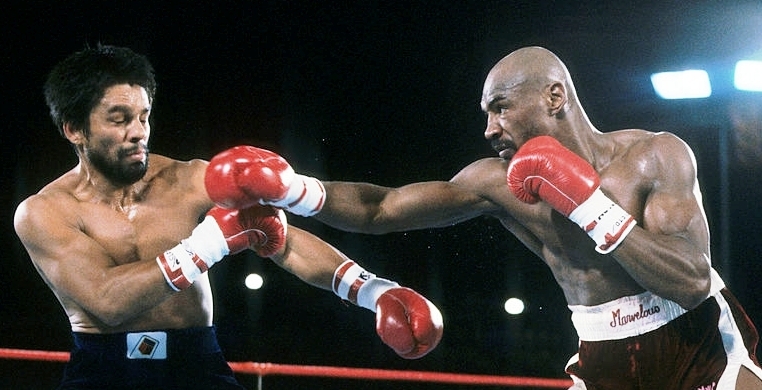 In 1982, Hagler saw two huge opportunities for big money slip through his fingers. In the spring he signed to face Hearns but “The Hitman” injured a finger in training and the match was first postponed and then cancelled. Then in the fall, Ray Leonard, having recovered from surgery for a detached retina, invited Hagler to the big press conference at which he would announce his future intentions. Marvin anticipated a challenge from Leonard and, finally, a huge money fight; why else would Ray invite him? But instead it turned out to be a big tease. In front of a large crowd in Baltimore, Leonard stated that a fight with The Marvelous One would never happen before announcing the first of several retirements. Hagler didn’t dwell on these disappointments. He went about his business, defending his title and building his legacy, notching impressive wins over contenders Tony Sibson and Wilford Scypion. Meanwhile, Roberto Duran, the disgraced yet still legendary former champion, who had quit against Leonard in 1980 and was widely viewed as washed-up, was about to regain his old form. And his drawing power. Duran then re-established himself as a major attraction with a surprisingly one-sided win over Moore in front of an exultant crowd at Madison Square Garden. And seated ringside was one Marvelous Marvin Hagler who jumped through the ropes the second the bout ended to congratulate the new champion. 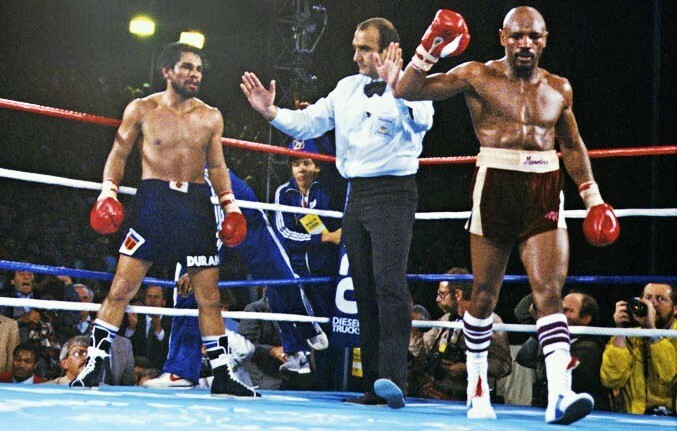 As he did, Hagler had one fact on his mind: he could make more money dancing with Roberto Duran than he had earned in his previous 61 bouts put together. Bob Arum also liked the idea. 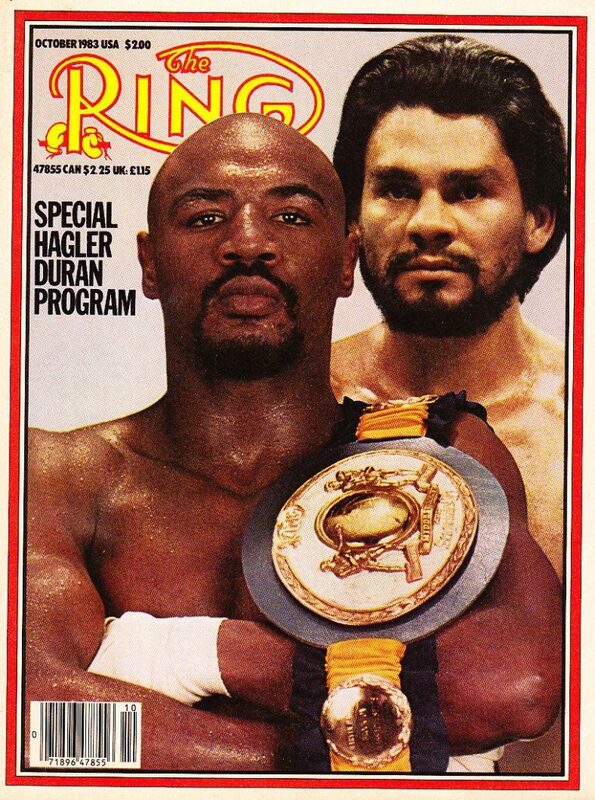 Hagler vs Duran, two ring legends, going head-to-head for the middleweight title was a sure-fire box office hit. The deal saw Marvin guaranteed $5 million, Duran $1.5, with royalties adding substantially to both purses. At long last, Hagler had the kind of big payday he had been searching for, a check with all the zeros that redeems the pain and grind of a long career in the fight game. Duran’s win over Moore made Hagler’s big payday possible. 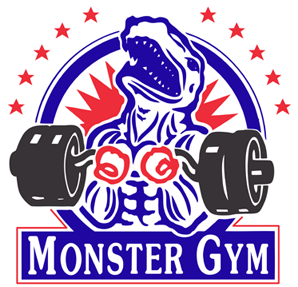 But while the participants gleefully signed the contracts and set about promoting the big event, the fight crowd was less enthusiastic. Having two champions and Hall of Famers squaring off sounded great, but the simple fact was virtually all the boxing experts gave Roberto, at best, an extremely slim chance of winning. Marvelous Marvin was younger, bigger, stronger, more powerful and possessed a granite chin to boot. Duran, a lightweight in his prime, would have been hard pressed to defeat the middleweight top contenders, let alone one of the most lethal battlers in the division’s history. While legions of impassioned “Manos de Piedra” fans celebrated his second coming and cheered him on as he prepared for this historic challenge, everyone else had great difficulty seeing how he posed a serious threat to the champion. 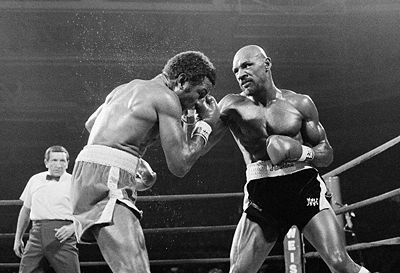 But Duran had one undeniable advantage: Hagler’s unfamiliarity with the “superfight” experience. This was Marvin’s first truly high-profile match, the kind of fight that’s more than just a sporting contest but also a major media event. Meanwhile, such attention and scrutiny was nothing new to Duran. A legend in his home country of Panama, a hero to millions of Latin-Americans, a veteran of several high-stakes title bouts, including battles with Leonard, Moore and Esteban Dejesus, Duran was accustomed to the cameras and the crowds and fed off the energy of his fans. By contrast, Hagler, who made a point of putting himself in isolation when training and who had no fan-base to speak of, found all the attention unfamiliar and unnerving. In the days leading up to the fight it was observed that Marvin seemed self-conscious and uncomfortable while Roberto appeared confident and relaxed. But likely this stemmed in part from the starkly defined expectations most had for this showdown. 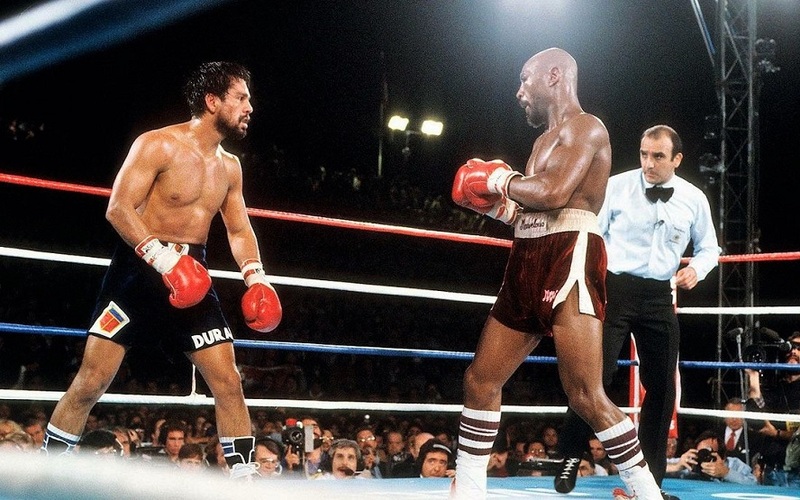 The champion was the clearcut favorite and what anticipation there was swirled around the question of how impressive Hagler would be, and if he could become the first to ever stop Duran. The pressure was on for Marvin not just to win, but to do so with a flourish, to dominate and fulfill his image as the best in the game. Meanwhile, Roberto, a solid underdog, had the luxury of living down to people’s expectations. Then there was the question of strategy. Hagler, with his shaved head and menacing glare had a reputation as a destroyer in the ring, while in truth he was a highly skilled professional, a balletic technician of smooth footwork and precision counter-punching, far more comfortable when his opponents came to him. 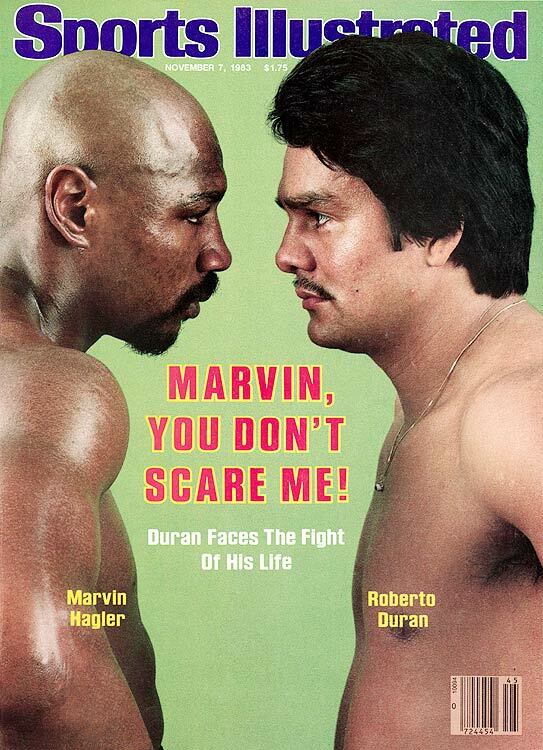 Hagler anticipated Duran attacking and thus trained to counter an aggressive challenger, but Roberto was no dummy. He had seen Hagler’s performances against Antuefermo and Sibson and knew to attack with abandon would be suicide. Instead he entered the ring with a plan to force his opponent to lead so he could be the one to land counter shots. Not surprisingly then, the fight itself was no classic, though for aficionados of the sport it was fascinating to watch two all-time greats at work, neither about to fall for the standard tricks of the other. But if any single factor defined the contest it was Hagler’s self-consciousness and caution. 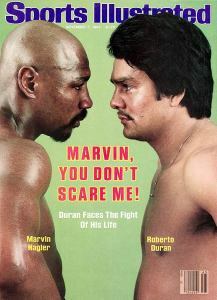 Wary and conservative from the start, Marvin waited and waited for Duran to attack, but Roberto refused. And by waiting, Hagler allowed Duran to seize the initiative. The early rounds belonged to the Panamanian as he slipped Hagler’s tentative leads and struck back. 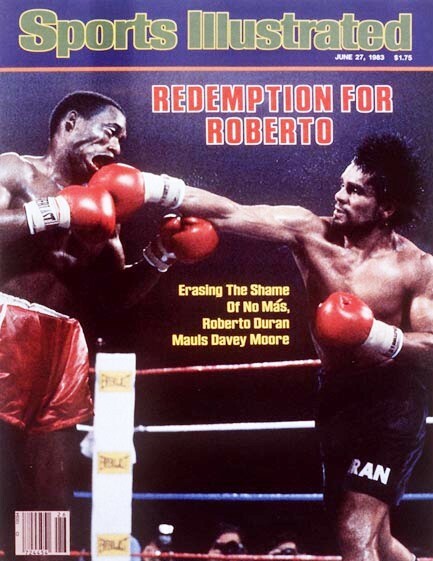 The champion was initiating, but without conviction, and it was Roberto’s counter-punches which excited the crowd, even when blocked by Hagler’s gloves. Repeatedly, Duran used his excellent timing and defensive skills to make the champion miss before countering with quick right hands. Hagler opened up more in the fifth as Duran tired, the challenger already breathing through his mouth, and in the sixth Marvin demonstrated he could in fact take over anytime he wanted. 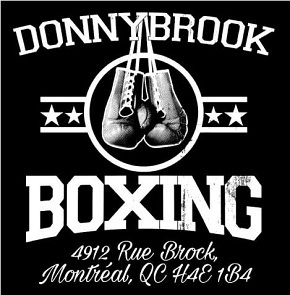 He pounded Duran with uppercuts, staggered him with a powerful left and for the first time put together hard combinations. Duran appeared frustrated and unable to cope with Hagler’s advantages in strength and power as, alarmingly, he absorbed more clean punches in that single round than he had in his last several fights put together. Forced to give ground and take shots, it looked like just a matter of time before Roberto folded under the pressure. But for whatever reason, Marvin was in no hurry to end the fight. While it appeared the champion could assume full control whenever he chose, Hagler’s conservative nature came to the fore. 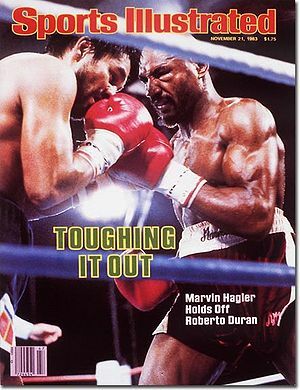 Perhaps wary of Duran’s experience and power, or perhaps feeling cowed by the pressure of the big fight atmosphere, Hagler boxed with skill but also with caution, taking few risks as he methodically outworked the challenger and swept the next four rounds. And then a curious sight presented itself in round eleven. Instead of pressing his advantages, the champion got up on his toes and boogied for three minutes. Perhaps it was a jig of joy, to celebrate having finally found a dance partner who could make him a multi-millionaire. Whatever the case, it was a baffling development, causing fans to boo the lack of action and giving Roberto a much-needed breather. 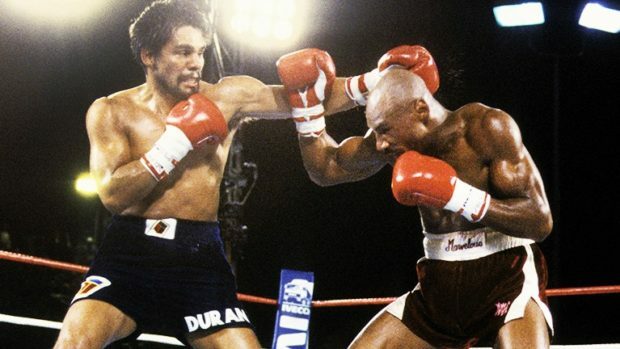 The respite rejuvenated Duran and in the next two rounds the challenger surged, standing his ground against the bigger man and repeatedly landing sharp rights to Hagler’s now damaged left eye. As the challenger worked his way back into the fight the crowd came to life, sensing that Duran, inexplicably, might yet have a chance to pull off the upset. And Hagler did, attacking with fury for the first time since the sixth and reversing the momentum. The final six minutes clearly belonged to the champion and in the end most ringsiders gave him nine or more rounds. Hagler had earned a clear-cut win, though the judges’ verdict was surprisingly close, two scoring him the winner by a single point. The decision aside, it had been a largely entertaining bout, though lacking in drama and highlight-reel moments. 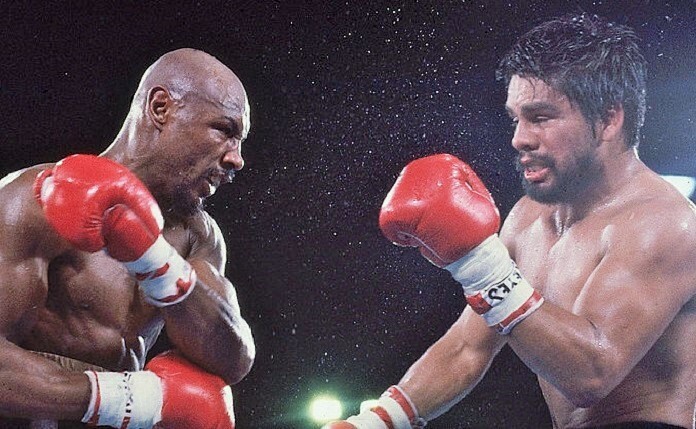 The irony of the contest was that the loser, having given Hagler a competitive battle and lasted the distance, saw his stock rise instead of fall, his performance seen as noble, even heroic, under the circumstances. Meanwhile, Hagler had failed to impress, pundits labeling his performance “workmanlike” and “unimaginative.” The champion was at pains to explain himself afterwards and wondered aloud why winning wasn’t good enough. 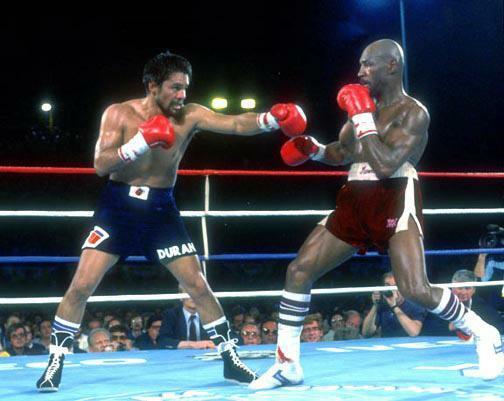 At the final bell Hagler waves away a defiant Duran. Probably one of the greatest fights in middleweight history. Top 20. But Hagler-Hearns, the Zale-Graziano trilogy, Hagler-Antuofermo 1, Duran-Barkley and a few others were better fights. Marvin Hagler lost that fight, imo. I had Duran the winner by one point. I agree. I watched it with the sound off and had Duran 145–144. 1 year later, sore winner Hagler stated “i have taken everything out of Duran”after the Hearns debacle. Hagler beating Hearns was impressive. One of the best underappreciated fighters in boxing history.